Super Pep, 30 capsules (Natural Balance) - Penn Herb Co. Ltd. Experience every moment of every day with renewed vigor and vitality! The Super Pep blend of energizing herbs, vitamins and minerals gives you a quick energy boost while supporting your energy needs throughout the day! 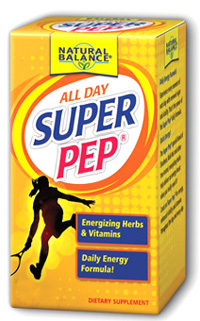 Count on Super Pep for energy, enhanced vitality and stamina throughout the day and every day. Use only as directed. Take 2 capsules daily. SEE PDF LABEL FOR WARNINGS.